Make Teacher Appreciation Week an extra-special week of memories for your hard-working middle school teachers. Organize a week-long program that recognizes every teacher’s dedication and appropriately thanks them for everything that they do for your school and students. 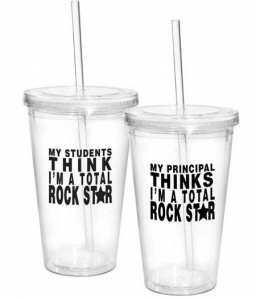 We have six cool ideas to totally “rock” your teachers from May 4-8. Choose one or two of your favorite ideas,or use a different idea for each day of Teacher Appreciation Week. Hand out tote bags and lunch bags with trendy recognition slogans to your middle school teachers. 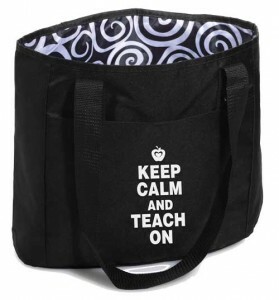 Quality, durable, and functional bags with slogans like “Keep Calm and Teach On” or “With Thanks” are practical alternatives to the standard certificates or pins. Your teachers will really appreciate the thought behind these bags. FUN TIP: Stuff your appreciation bags with smaller functional gifts like candy, T-shirts, key chains, lanyards, coupons, and more. Most of your busy middle school teachers deal with SmartPhones, tablets, and other electronic items on a daily basis at school and at home. 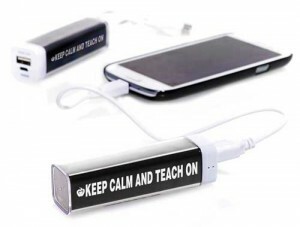 Electronic accessories like phone pockets, power banks, and cell phone holders make functional gift choices for Teacher Appreciation Week. Convenient technology accessories are welcome additions for teachers’ phones and tablets, and keeps them organized. 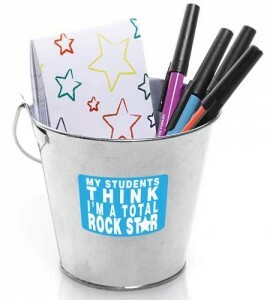 A more unique idea for Teacher Appreciation Week are Tin Buckets. Fill your buckets with small goodies to mark one day of Teacher Appreciaiton Week. Goodies for your buckets include everything from small notepads, pens, and pencils, to gift cards and coupons. 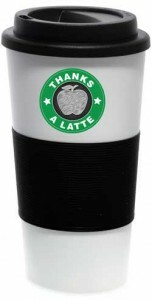 Our new “Thanks A Latte” items are whimsical ideas for your middle school teachers, especially your coffee-loving staff! Hand out one gift each day or present all three items (travel mug, lip balm, and pin) together as a gift set. Create a colorful display or party space quickly and easily for Teacher Appreciation Week with Lounge Makeover Kits. These kits include everything you need to decorate for a teacher recognition presentation. All you need is some tape, tables, and a little time to transform your middle school teacher lounge. This is a great idea to mark the last day of Teacher Appreciation Week. How will your middle school celebrate Teacher Appreciation Week?